Srimad Bhagavata Mahapurana expounds the profundity of thought and philosophy in simple language as preserved in Vedas, Upanishads, epics and ancient scriptures including Puranas. Puranas also reveal the truth of life and existence through various tales, but immense simplicity of Srimad Bhagavata Mahapurana makes it popular. People frequently organize yajnas, listen to the tales and sing glory of lord Krishna and the incarnation of lord Vishnu (the lord of Gods). It has tremendous spiritual and religious appeal and value, and the mere listening to the discourse eliminates earthly, physical and materialistic sufferings, and grants spiritual illumination and ultimate salvation. Puranas also known as the fifth Veda have source in interrelated historical facts and truths. 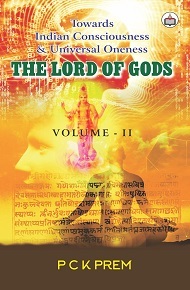 The sacred books idolize and praise lord Vishnu, the Supreme Lord, who assumes various forms of gods and deities (The great Trinity –Brahma, Vishnu and Mahadeva, Shakti and other gods). The objective is to teach man the true art of life based on truth and righteousness, the Sattvagunas. In Vedas, the path of karmas (deeds), penance (tapa or upasana), and knowledge and wisdom (Jnana) gets prominence whereas Srimad Bhagavata Mahapurana exhorts human beings to recognize the true import of devotion because devotion (bhakti) is the right path to attain deliverance (moksa or mukti). P C K Prem (p c katoch of garh-malkher, palampur, himachal, a former academician, civil servant and member, public service commission, himachal, shimla), an author of several booksis a poet, novelist, short story writer and a critic in English and Hindi from Himachal, India.